This totally untraditional crayfish goulash was made using paprika from Hungary. According to my Larousse, goulash is a Hungarian beef soup named after the keepers of the Magyar oxen (gulyas). The origin of this dish which is now made with onions and paprika and garnished with potatoes, dates back to the 9th Century, before the foundation of the Hungarian state, when nomadic tribes prepared a meal that was in keeping with their way of life. At that time goulash consisted of chunks of meat stewed slowly until the cooking liquid completely boiled away. The meat was dried in the sun to be used later to prepare a stew or a soup by boiling it in water. Traditionally, goulash is made in a special cauldron (bogracs). There are a number of regional variants of the recipe according to the cut of beef and the cooking fat used, but purists agree that goulash should not include flour or wine, nor should soured cream be added just before serving. 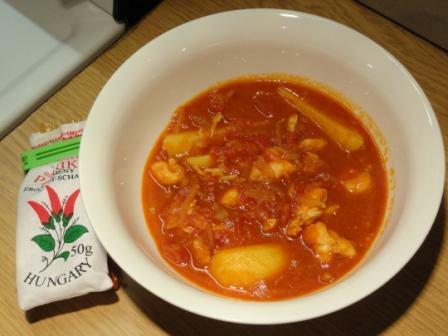 Hungarians regard Viennese goulash as a flour-thickened version of genuine goulash soup; in Hungary the latter is sometimes served with potatoes and small quenelles of egg pasta, poached in stock. I was given a bag of paprika from my friend after their visit to Hungary and knew that I had to use it straight away. We did not have any beef out of the freezer, but as our local ingredient is the crayfish we catch ourselves, I could see no reason why not to substitute the beef for crayfish to make this delicious goulash. Sounds delicious! we made so much paprika chicken that sadly there is no Hungarian paprika left! I will savour my pack then! Thanks for this, you’ve given me my supper idea.